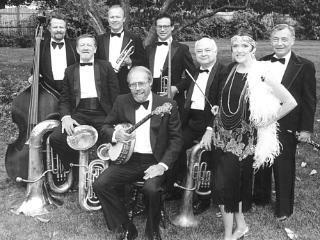 In 1947, a group of Purdue University students formed the Salty Dogs Jazz Band. In the earliest days of jazz, Indiana was the place where the great bands played, recorded and set down their musical roots. The Salty Dogs Jazz Band was born from that tradition and they continue today as living testament that great hot jazz will live forever. When graduates of the Salty Dogs left the Purdue campus in 1960, the band performed and spread the joy of traditional jazz across the United States. Today, with the same personnel from the 1950s and with fifty additional years of experience and polish, they are acclaimed as one of the foremost traditional jazz bands in the world. The roots of the Salty Dogs dig deep to the early jazz musicians of the 1920s- Hoagy Carmichael, King Oliver, The New Orleans Rhythm Kings, Jelly Roll Morton, Bix Beiderbecke, Hitch’s Happy Harmonists, and Louis Armstrong. They all recorded in Richmond, Indiana and many of their sidemen settled in the Chicago area. In the 1950s and 1960s, many of these players were still active and performed side-by-side with members of the Salty Dogs. The list includes some of the greatest names in jazz history: Georg Brunis, Lil Armstrong, Quinn Wilson, Darnell Howard, George Lewis, Lou Black, Jim Lannigan, “Little Brother” Montgomery, “Banjo” Ikey Robinson and a host of others who shared their music, knowledge and notes with the Salty Dogs.